Does Gold belong in an institutional investor’s portfolio ? It’s a question that’s been on my mind for a few weeks. Ever since the gold price saw moves which amounted to experiencing an entire year’s worth of volatility in a single day, I’ve been wondering whether such an asset deserves a place in the portfolio of a long term investor seeking diversified sources of return. Despite Buffet’s views, gold bulls would point to the fact that gold has supposedly held its purchasing power over thousands of years , whereas gold bears point to a 20% peak-to-trough decline in price this year alone as evidence that gold is far from the “safe-haven” asset that some would claim. What does belong in an institutional investor’s portfolio ? 1) Seeks out long term sources of return (or risk premia) that have a fundamental justification, For example over the long term an investor can expect to be rewarded for bearing the risk of fluctuating equity prices with dividend growth and potentially price growth. A lender can expect to be rewarded for bearing the risk of an entitity defaulting on its debt obligations through the payment of a higher interest rate. 4) Avoids any assets which bear significant regulatory, political or other undesirable ideosyncratic risks. This would rule out (for example) assets such as fine art, bitcoin. This is where it gets interesting. A detailed look at the properties of gold leads to some interesting findings. Gold tends to have somewhat of a Jekyll and Hyde character, as described elegantly by Izabella Kaminska in the FT Alphaville. To summarise Izabella’s point, gold has historically had two very different sides to its character as a financial asset, corresponding to whether it behaves like a collateral asset or a stock asset. These two states are connected to the shape of the gold forward curve and whether this exists in a contango or backwardated state. John Maynard Keynes argued that where speculators are offering suppliers a fixed future price for their supply (in an uncertain world), the suppliers would pay a small premium for this certainty, earning the speculator a return, or a risk premium. This situation would be associated with a backwardated gold forward curve – where the price for future delivery is below the current price for spot delivery. In practice this state has rarely been observed in the gold market. When the price for forward delivery of gold is above the current price (ie, in contango), this suggests a risk premium can be earned by buying the physical asset in the spot market, selling it for a (higher) fixed price in the future and holding the trade to maturity. It turns out that historically both of these risk-premium arguments have been largely drowned out by the noise in both the gold spot price and forward curve, and that the risk-adjusted return to holding gold (or indeed other commodities) has been relatively small, and quite sensitive to the time period chosen for analysis. The key point is that the dynamics of the gold price and the possible reasons for a positive risk premium associated with it vary – can we really justify a portfolio allocation to an asset whose properties can change so fundamentally through time ? That’s not all. If we take a look at the shape of the gold volatility surface through time we discover yet more interesting characteristics. At some points in time (like September 2011) supply and demand for gold options dictated that call options (those that are used to speculate on a sharp price increase) were relatively expensively priced compared to puts. At other points in time the opposite is true and the demand for options that protect against a fall in price is greater. This is a relatively unique property for an asset – usually the market for options will show a consistent skew one way or the other. Equities for example are overwhelmingly skewed toward higher prices for put options. How should we even classify gold as an asset class ? Eric Sprott argued in this analysis on zerohedge that gold in in fact a currency not a commodity, due to a lack of consumptive uses and the fact that it represents a form of currency whose supply cannot be manipulated in the same way that of “paper” or FIAT currencies can. He shows that the price of gold measured in US dollars increased broadly in line with the expansion of the Federal Reserve balance sheet (a measure of the supply of FIAT US dollar currency). I would agree with this analysis from seekingalpha that argues the precise classification is a bit of a moot point, “the definition of currency isn’t static, and means different things to different people”. 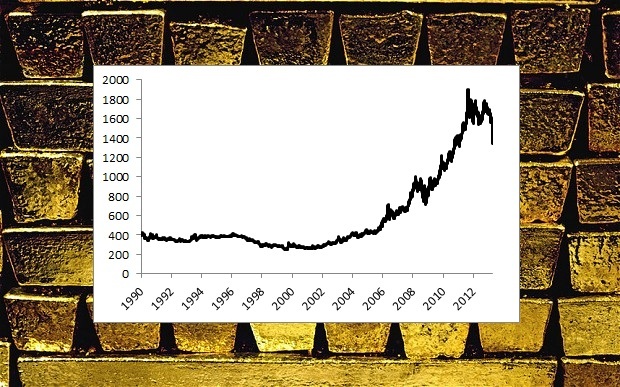 What is clear is that because of the varying dynamics of gold, the influences on its price from both supply/demand and financial considerations, lack of an intrinsic value attributable to income or other point of anchor to the valuation, the gold price when measured in terms of a FIAT currency such as the US dollar is vulnerable to changes in conventional wisdom and therefore can be quite volatile – stable disequilibrium as economists might call it. 1) a hedge against a hyper inflation scenario caused by the expansion of the supply of FIAT money (note this a related but different exposure than that of a broadly pro-cyclical asset which benefits from modest increases in inflation associated with positive economic news). 2) A hedge against the collapse of (or the expectation of the collapse) of FIAT money as a form of exchange, and the return to a system that uses precious metals. Mohammed El-Erian made a very similar point here. Both of these are – according to most analysts – relatively unlikely but not inconceivable events, which are likely to negatively impact a portfolio allocated to mainstream return seeking assets such as equities, credit and fixed income. Which leads me to the conclusion that for a long term investor, it makes sense to allocate a small part of the portfolio’s total risk budget to hedges against these events. This should improve the portfolio’s overall risk-adjusted return expectations. This is essentially arguing for the inclusion of gold as a diversifying asset, in portfolios which might experience negative outcomes in those scenarios where the gold price might be expected to increase. A diversifying asset reduces an investor’s dependency on any one particular outcome – it allows us to be wrong on one of our views. In this sense, we can view gold alongside a broader set of commodities that will, to greater or lesser extents provide similar exposures. These will include Industrial Metals, Energy and Agricultural Commodities. The correlations of these commodity sub-classes with each other are positive but not close to one, this is because from a behavioural perspective they each cover a slightly different angle on the “inflation shock” risk scenario. The most logical way to allocate capital between these sub-classes absent a specific view of the future state of the world is to allocate equal risk weights, according to realised volatility. However this does lead to a commodity portfolio that looks quite different to traditional commodity indices, whose allocations are often dominated by Energy-related commodities. Conclusion – how much gold should an institutional investor hold ? Gold sits alongside other commodities as a diversifying asset – historically including these assets would increase portfolio risk-adjusted returns. 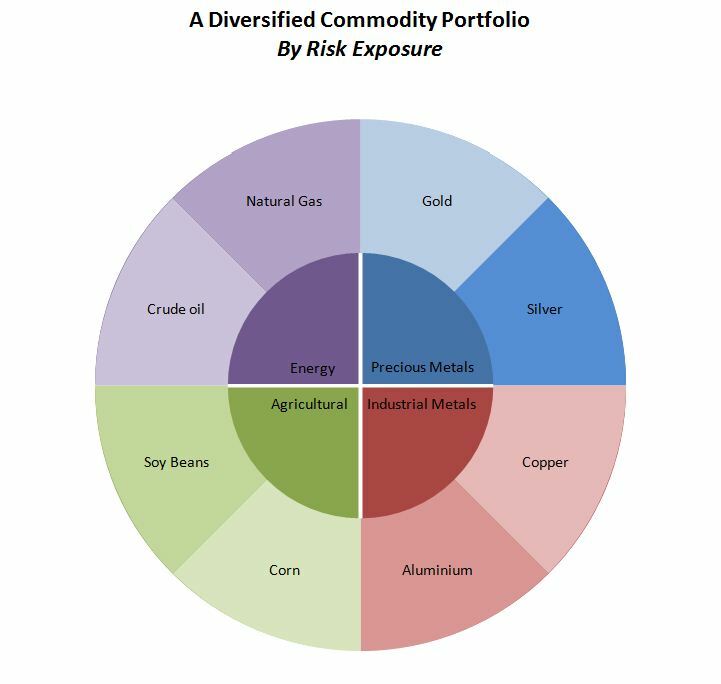 However, as we have noted above, gold and other commodities can be very volatile, this argues for both a risk-based, and diversified approach to allocating among them. Precious metals might sensibly form around 25% of a portfolio’s commodity risk exposure, with this itself being split between silver and gold.